The Odorox® Decon Scrubber unit is an excellent choice for portability and effective removal and decontamination of large volumes of particulate and pollutants from the air. 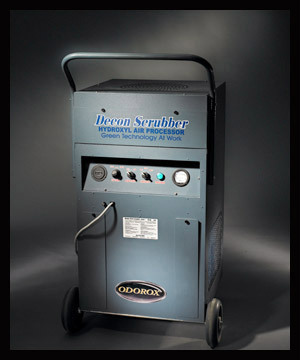 The Decon Scrubber™ is designed to eliminate odours and particulate associated with bacterial, viral and mould contamination and removal of large amounts of smoke, ash, animal dander and pollen. The unit will also remove odours caused by incinerated/burnt plastics, organic matter, and chemicals. Wheeled for mobility it is suitable for spaces up to 5000 sq.ft. (500 sq.m. ), assuming a 9ft/3m ceiling and so popular in medium to large commercial facilities like clinics, schools, offices, prisons, manufacturing & agricultural facilities, and is ideal for insurance and disaster restoration projects. Odorox®, Boss Decon Scrubber™ and HGI Industries Inc. are either registered trademarks or trademarks of HGI Industries Inc. of Boynton Beach, Florida USA. Other trademarks are pending in the U.S. and other countries.